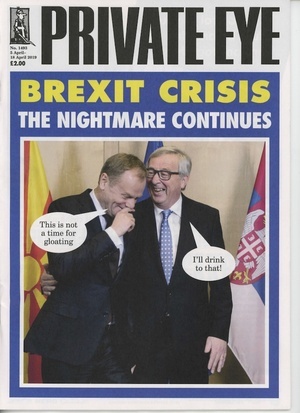 Posted in Misc and tagged Donald Tusk, Jean Claude-Juncker, Private Eye at 11:50 am on April 2, 2019 by Bodger. 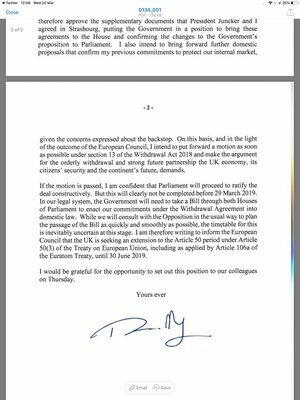 British PM Theresa May’s letter to the president of the European Council Donald Tusk in which she asks that the Brexit process can be delayed until June 30, 2019. Britain was scheduled to leave on March 29, 2019. JC Juncker’s spokesperson says he warned her – before today! 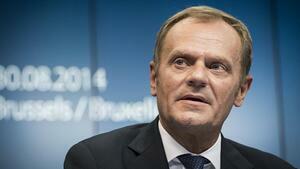 – not to extend beyond May 23 or the UK would have to hold European elections. 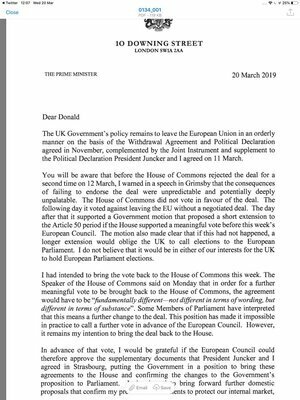 Posted in Misc and tagged Brexit, Delay, Donald Tusk, Extension, Theresa May at 12:33 pm on March 20, 2019 by Bodger. 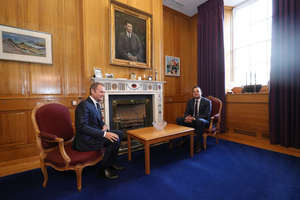 At Government Buildings in Dublin. 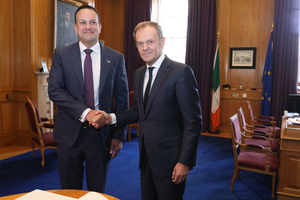 Taoiseach Leo Varadkar meets European Council President Donald Tusk for talks ahead of the European Council summit later in the week. 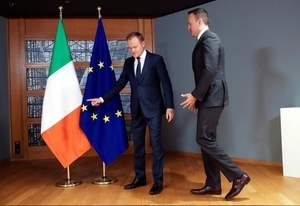 Posted in Misc and tagged Donald Tusk, Dublin, Leo Varadkar at 2:05 pm on March 19, 2019 by Bodger. 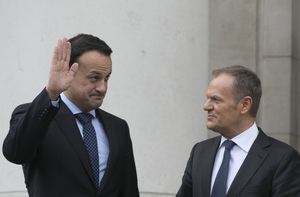 Taoiseach Leo Varadkar is shown where to stand by European Council President Donald Tusk before their meeting at the Europa building in Brussels, Belgium this morning. 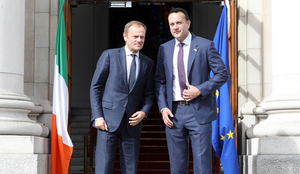 Tusk, speaking at a joint news conference with Irish Prime Minister Leo Varadkar after their talks in Brussels, reiterated the European Union’s stance that the Irish border backstop in the withdrawal agreement had to stay. 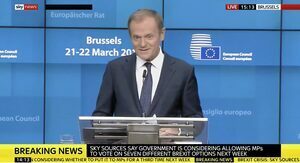 “I’ve been wondering what that special place in hell looks like, for those who promoted Brexit, without even a sketch of a plan how to carry it out safely,” Tusk said. 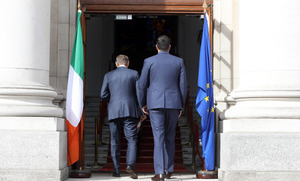 Varadkar said the Brexit deal, which has since been rejected by the UK parliament, was “the best possible”. He said Britain’s recent political instability was yet another proof of why the backstop was needed. 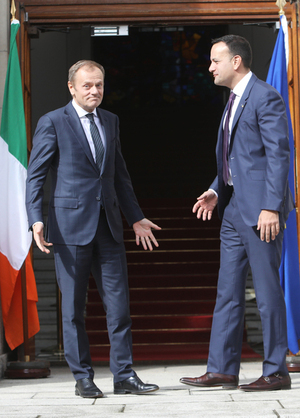 Posted in Misc and tagged Brexit, Donald Tusk, Leo Varadkar at 12:20 pm on February 6, 2019 by Bodger. 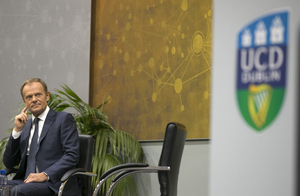 President of the European Council Donald Tusk became an Honorary member of University College Dublin (UCD) Law society. 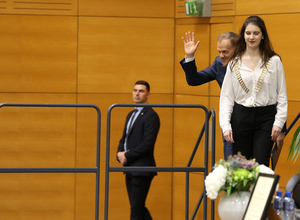 Mr Tusk gave a speech addressing his vision of Europe, Politics and Brexit , the future of European integration beyond the completion of the Monetary and Banking Union and his personal experience as a student political activist in Poland. Posted in Misc and tagged Donald Tusk, UCD at 11:45 am on April 11, 2018 by Bodger. 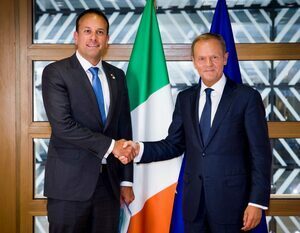 Taoiseach Leo Varadkar with President of the European Council Donald Tusk ahead of a meeting on Brexit. 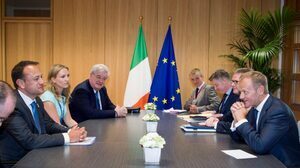 Posted in Misc and tagged Donald Tusk, Leo Varadkar at 3:25 pm on March 8, 2018 by Bodger. “That is ultimately a decision for them, however, and that may change. Countries can take positions, often very strong positions, they are often negotiating positions, and yet the final outcome might be more favourable. 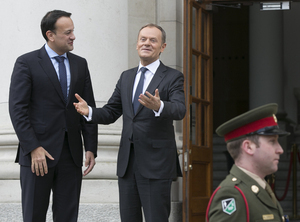 Taoiseach Leo Vardkar today following a meeting with Donald Tusk, President of the European Council. Posted in Misc and tagged Brexit, Donald Tusk, European Council, leo vardkar at 4:25 pm on June 22, 2017 by Broadsheet. Only strong states are capable of supporting those in need on a large scale, without the risk of self-destruction. Tough policies do not rule out humanitarian goals – quite the opposite: only determined policies enable their implementation. If we want Europe to remain open and tolerant, we can no longer allow ourselves to be helpless. We need the solidarity and determination of all member states in every aspect of migration policy: relocation, humanitarian aid, external actions, and most crucially protecting our external borders. What is at stake is not only the future of Schengen, but the future of our community. Recent experience with Turkey shows that Europe must set clear limits to its concessions. We can negotiate money but never our values. 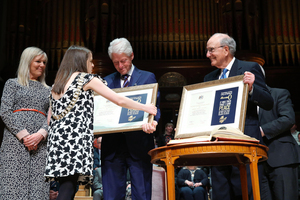 We cannot impose our standards on the rest of the world. 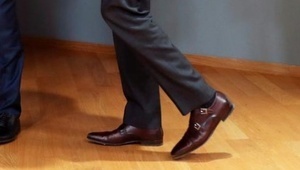 Equally, others cannot impose their standards on us. Our freedoms, including freedom of expression, will not be part of political bargaining with any partner. The Turkish president must heed this message. 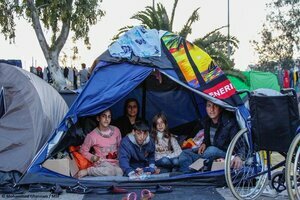 Posted in Misc and tagged Donald Tusk, Europe, refugees at 11:36 am on April 22, 2016 by Broadsheet.